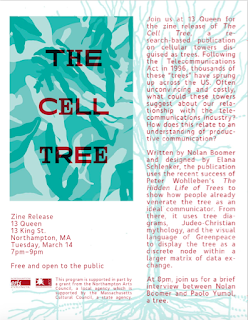 Join us at 13 Queen for the zine release of The Cell Tree, a research-based publication on cellular towers disguised as trees. Following the Telecommunications Act in 1996, thousands of these “trees" have sprung up across the US. Often unconvincing and costly, what could these towers suggest about our relationship with the telecommunications industry? How does this relate to an understanding of productive communication? Written by Nolan Boomer and designed by Elana Schlenker, the publication uses the recent success of Peter Wohlleben’s The Hidden Life of Trees to show how people already venerate the tree as an ideal communicator. From there, it uses tree diagrams, Judeo-Christian mythology, and the visual language of Greenpeace to display the tree as a discrete node within a larger matrix of data exchange. 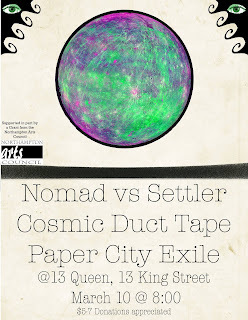 At 8pm, join us for a brief interview between Nolan Boomer and Paolo Yumol, a tree. 13 Queen is an arts & media studio space in Downtown Northampton, MA.